A body pillow is a remedy to most of the discomfort we experience at night. This article is a guide to buying the best body pillow. It outlines the benefits of using a body pillow, types of body pillows, factors to consider, and reviews 5 of the best body pillows. Why Should You Buy a Body Pillow? 1. Provide extra support – Body pillows support the head, neck, spine, shoulders, and hips while we are sleeping. They keep the upper body in alignment with the rest of the body for more comfort at night. Body Pillows are important particularly to those with spine problems. They help to rest the spine comfortably when a person is sleeping. 2. Relieve pressure – A body pillow is a great way of relieving pressure from the lower back, hips and the spine. 3. Additional support during pregnancy – The body pillow supports the belly and the back to offer more comfort and eliminate the lower back pain experienced during pregnancy. 4. Alleviate snoring – I had a habit of snoring because I used to sleep on my back. I got rid of this problem by getting a body pillow that helps me sleep on my side. 5. Provide calm and relaxation – One of the main reasons why I bought a body pillow is to hug while sleeping. Hugging has great health benefits such as lowering the heart rate and creating a calming effect on a person. 6. Get rid of pain – Sleeping with a body pillow has been proven to eliminate pain as a result of headaches, insomnia, Arthritis and Fibromyalgia. 7. Comfort – A body pillow provides the user with appropriate support for more comfort at night. It allows him/her to sleep at more therapeutic positions without turning and tossing. 8. Muscle relaxation – Sleeping with a body pillow distributes the body weight and enhances muscular relaxation. It also allows the body to stay still allowing the muscles to relax. 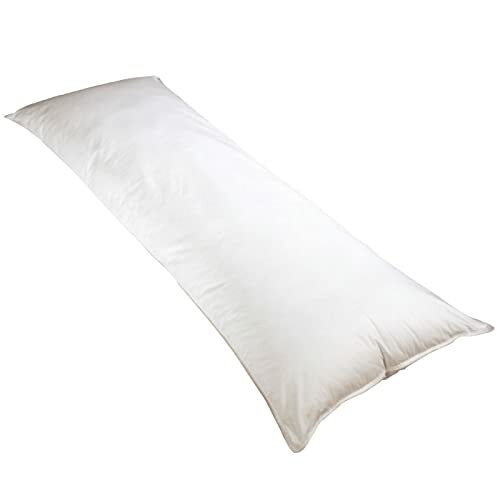 Full body pillow – This is a large pillow that is designed to offer support to the whole body while sleeping. Heated body pillow –This body pillow is designed to cater for people living in cold areas by keeping them warm. Micro-bead body pillow – This pillow is soft and mainly used to relieve neck and shoulder soreness which is caused by sleeping on a firm mattress. It is also great for pregnant women. Snoozer body pillow – This pillow is designed for spinal alignment by supporting the hips and the shoulders. It eliminates pressure from the various parts of the body.It also improves blood circulation and muscular relaxation. Round body pillow – This pillow is used to support the neck. In some households, it is used as a floor pillow. Plush body pillow – This is a soft body pillow that is used to offer comfort and style to a room. Inflatable body pillow – This pillow is filled with pumping air. It is mainly used in medical devices. 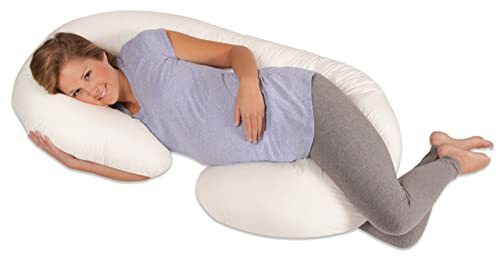 Pregnancy body pillow – This body pillow eliminates back pain and hip pressure. It is mainly used for maternity purposes to provide extra support. How Do You Choose the Best Body Pillow? 1. Size – A good body pillow is one that covers your body from the head all the way to the knees for maximum comfort. Large body pillows occupy a lot of space on your bed. It is also difficult to store them due to their large size. If you have a limited space, consider a small body pillow. The material that a pillow is filled with will determine how comfortable or uncomfortable it is. You can pick a material that is rough such as polyester and neutralize it with a cotton pillow case that is soft. The durability of a body pillow also depends on the filling. Some materials are resilient to flattening than others. Some materials retain heat while others disperse it. Pure cotton is one of the best materials at losing body heat. Shredded foam is better at dispersing heat compared to solid foam. 2. Types of fillings – Cotton body pillows are cheap but not durable. Foam body pillows are expensive but are good for muscular relief and supporting the body because they conform to the shape of the body. Synthetic fiber body pillows are comfortable but they retain body heat. Body pillows made of feathers are soft but can cause allergic reactions. Down plush make soft body pillows. Body pillows that are made of Buckwheat are soft. They also adapt to the body shape. Some body pillows are made from hypoallergenic materials to cater for those who are allergic. 3. Quality of manufacturing – Body pillows that are handmade is better quality. They are also more expensive than regular ones. 4. Purpose of the body pillow – A particular body pillow will serve a unique purpose. It can be used to relieve back and neck pain, eliminate snoring or offer support to a pregnant woman. Some people use body pillows such as plush body pillows to add style to their living room. 5. Shape – Body pillows are designed in different shapes and each shape has certain benefits. C-shaped body pillows are meant to prevent rolling while sleeping. The same case applies to J –shaped body pillows. U-shaped body pillows on the other hand offer full body support. These body pillows are the best for pregnant women and those with back injuries. The purpose of the body pillow determines the type of a pillow that suits you. 6.Price – Pick a body pillow that fits into your budget. 7. Reviews – Look at the reviews of other buyers about the body pillow before buying it. 8. Warranty – Some body pillows come with a warranty from the manufacturer against flattening. 9. Where the pillow is made – The place where the pillow is manufactured determines the quality and price. This C-shaped body pillow was designed by a nurse to offer support to the back, hips, neck and the tummy. It was made for maternity comfort by supporting the belly and preventing the back pain associated with pregnancy. It adapts to the changing body of a woman at the various stages of her pregnancy. It can also be used to reduce pain from diseases such as Arthritis and Fibromyalgia. The pillow case is made of polyester- cotton blend that makes it soft and gentle. This case is removable and machine washable. I really appreciate the fact that the pillow cases come in various colors and designs to give the buyer a variety to choose from. The body pillow is 60 by 24.8 by7.2 inches. The pillow case has a durable zipper. Difficult to change and replace the pillow case. Difficult to store due to its large size. This straight body pillow by Snuggle-Pedic is very comfortable for side, back and stomach sleepers. It offers extra support to the back and the neck. The memory form that is used to fill it is great, it helps the pillow to stay firm for a long time. This body pillow is hypoallergenic and dust mite resistant to cater for those who are allergic. The Kool-Flow is another great feature that allows air to move throughout the pillow keeping the user cool. The pillow has a refund guarantee within 90 days and a 20 year warranty. I really appreciate that this pillow is fully machine washable, unlike most body pillows. It’s huge and occupies a large space in your bedroom. This body pillows by PharMeDoc is designed in a C-shape which is great to support the back, neck, belly, spine, and legs. It measures 60 by 24 by 7 inches. This body pillow is firmer than a regular pillow.It is intended to reduce pressure to the body joints. It has a removable pillow case which is machine washable. This cover is made from a material that is free of heavy metals and organic substances. The pillow cover also has a zip. The body pillow is suitable for side and back sleepers. It is also perfect for pregnant women. This body pillow by Moonlight Slumber helps align the hips, neck, shoulders and the back. It also prevents the user from turning and tossing due to discomfort. It enables the user to sleep in the side position which enhances blood circulation, prevents swollen legs and gets rid of back pain. It is designed to enhance air circulation to keep the user cool all night. The pillow case is organic, hypoallergenic, odorless and dust mite resistant. 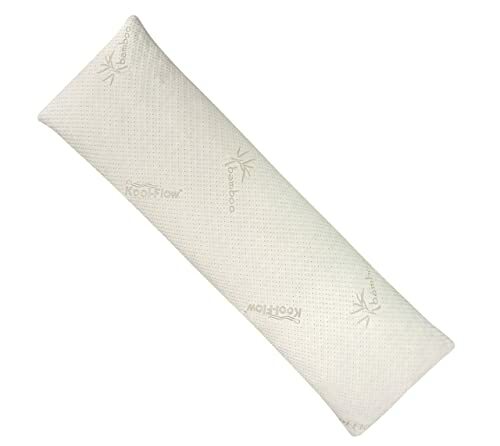 It has a fusion fiber-fill that allows air to flow freely and keep the body pillow firm. This pillow is machine washable. This body pillow by Newpoint Corporation is designed to support the head, knees, and arms. It is ideal for pregnant women and anyone who needs support and padding throughout the body. It measures 20 inches long by 54 inches wide by 5 inches high. It is filled with polyester fiber which is hypoallergenic. The cover is crafted in 235-thread count with 100-percent cotton material. It is also machine washable and very comfortable. 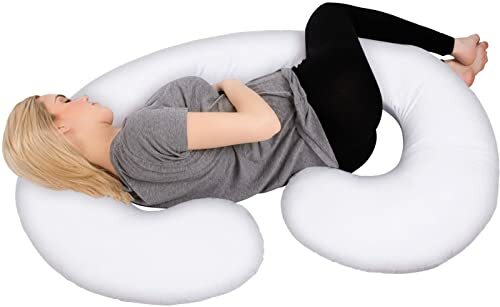 This pillow is huggable and shapeable to allow the user to sleep in a comfortable position. It adds luxurious comfort to your bed. It is most suitable for side sleepers. It is cheaper compared to other body pillows. These five body pillows come with unique benefits. The best body pillow for you will be dictated by your personal preferences. However, Leachco Snoogle Total Body Pillow seems to have it all. The pillow cases are made from polyester- cotton blend that makes them very soft and comfortable. Furthermore, they come in different colors and designs. This feature allows you to pick the one that matches with your beddings. The C- shape design makes the pillow suitable to support all body parts such as the hips, back, neck and tummy to relieve any pain. Compared to the other body pillows, it is more durable and resistant to flattening. It is versatile because it can be used by both pregnant women and any other person. The breathable cover allows the user to stay cool at night.